The road that led to Katarina Aubry's cabin seemed to climb the ridge endlessly, until it flattened out to a plateau of deep forest for what seemed like many miles. The house, studio and garden were nestled by themselves in a quiet woodland clearing. She was hanging her tomato vines on trellises to catch the last of the autumn sun, and stoking her stove to take the chill off the wet canvas in the studio. Katarina is clearly as comfortable in this wildness as she was in Paris, her native city. Katarina: While I studied at art school in Paris, I made many, many copies and sketches of art from the Louvre. I sketched from life at cafes, and did portraits in the cafes. After school I got a job repairing old posters from the time of Toulouse-Lautrec. This rounded out my education. As long as you are raised in Europe, art is in your blood. You are surrounded by old stones, by testimonies of the past, so it is natural to be drawn to make art because it is all around you. S: What are some of the influences from those surroundings that have brought you to your way of working now? For instance, when I look at your paintings, I certainly see the influence of Picasso, but I am also reminded of Ivan Generalic, one of the farmer/painters from Croatia. These painters would paint in the winter and farm in the warm weather. This school of painting strongly influenced Marc Chagall. The skies in your paintings and the way the landscape is drawn are very similar to this. 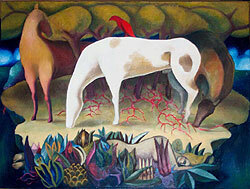 Generalic recorded scenes of village life, but your work takes the relationship to nature to a mythic, dreamlike level. Where did this come from? K: In Paris there was very little nature, so I painted people. But I was raised in the farm country of Brittany, where we had a little farm, and I retained the longing for the country. All of a sudden, during the time when I was repairing posters, I made a painting of a woman who is also a tree. This became a leitmotif for me, and I kept returning back to it. I seemed to have tapped into an undercurrent, perhaps of an unconscious place that belongs to all of us. For instance, I once met a woman from Hawaii who told me that the image in one of my paintings looks exactly like the Hawaiian goddess of the volcanos. Her fiery red hair is flowing between the hills, and she is escorted by a pack of dogs under a dark sky. I had never seen an image of that goddess. A German woman pointed out to me that another painting replicated the image of an old European spirit associated with crows. Again, I had never read the German folk tale. S: The differences between the languages of the world lead us to believe that our stories are really different, but often we find that, in the language of art and music, those boundaries do not exist and that we can communicate across cultures with these images. What would you say has been the strongest influence on your choice of imagery? K: I have spent quite a bit of time on this continent, in New Mexico. The seashore and interior of Nova Scotia, and the seashore of Cape Cod have been another great influence. I would say that the wild, natural areas of North America have been the single greatest influence on my work. Coming from Europe, where everything is tight together, and going where there is such vastness, such a huge expanse of sky and trees that are hundreds of years old, this is as powerful for me as being surrounded by old cathedrals and old stones. In other words, my creative impulse has sought a balance between culture and nature. I would like to be totally fluid and make a union in myself between the two. When I am in New Mexico, wherever I am walking there, I find pottery shards everywhere. I collect baskets of them and give them to my native American friends. The Native American culture, the tribal culture there is very inspiring. When I was about twelve years old, I wanted to become an archaeologist, and there was for awhile some regret about not pursuing that, until I realized that what I am doing with my painting is a kind of archaeology, where I am digging through layers of imagery to connect with common areas in the subconscious -- a kind of archaeology of images. S: Ancient traditions are reflected strongly your work: magic, masks, the animals, the forest, and, to some extent, ritual. This is combined with an exploration of women and groups of women. K: These things come naturally to me from my life as a child on the farm. When I moved here, I was surrounded by this again, and these images exploded out of me: trees, women, angels, birds, sky, earth. This is solitary work, and sometimes I feel totally selfish when I am out alone and painting. Visual imagination can take you anywhere you want to go. The hills of Vermont can become the waves of the sea when you have a longing for the sea. More and more, I am appreciating the isolation of these hills, for the opportunity for focused work and meditation that it provides. My life as an artist has been a continuous process of deeper focus since I first sketched in cafes in Paris. It was just a matter of perseverance. I start with a broad, approximate idea in a sketch. It's like when the French came to this country. From the broad mouth of the Mississippi the explorers went searching for the source. I am searching with paint for the visual "springs" that eventually become the river. I hope that my images are a little enigmatic, as close as possible to a visual poetry. Sometimes when I step back from a completed painting, it reminds me later of an experience or dream from the past, which I am actually unaware of when I am painting. I paint women because I am a woman. In the summertime when I come in from the garden and I have dirt in my fingernails and I am covered with mud, it is a fluid activity to go from the garden and paint; the two activities nourish each other. My ideas are refreshed after being in the garden, or in the woods hunting morel mushrooms. At this time in history women are coming out of the hole, so to speak, to express themselves. Half of the planet is suddenly being heard! In the past, for instance, artistic women in this culture were able to express themselves through making quilts, through crafts. When women got together as a group, they made abstract fabric paintings that are as powerful and beautiful as Mondrian, or any abstract artist. Now that energy is manifesting through all of our individual voices. 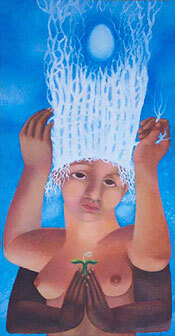 Katarina Aubry will be the featured artist in February at Gallery in the Woods, 143 Main Street, Brattleboro. An opening reception for the artist is scheduled for Gallery Walk on Friday, February 6, from 5:30 to 8:30 pm.